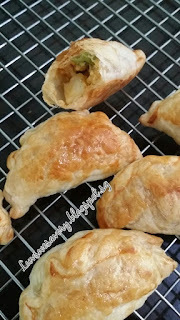 There are times that I just wanna have some curry puffs but didn't want to deep fried or make the dough from scratch. 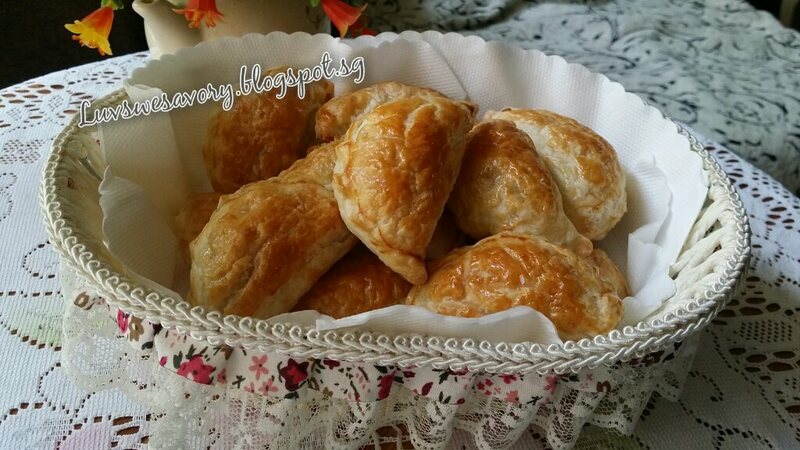 Yes .. lazy me .... Store bought frozen puff pastry is quite versatile and convenient to turn them into easy fruity tarts or savoury puffs/pies. 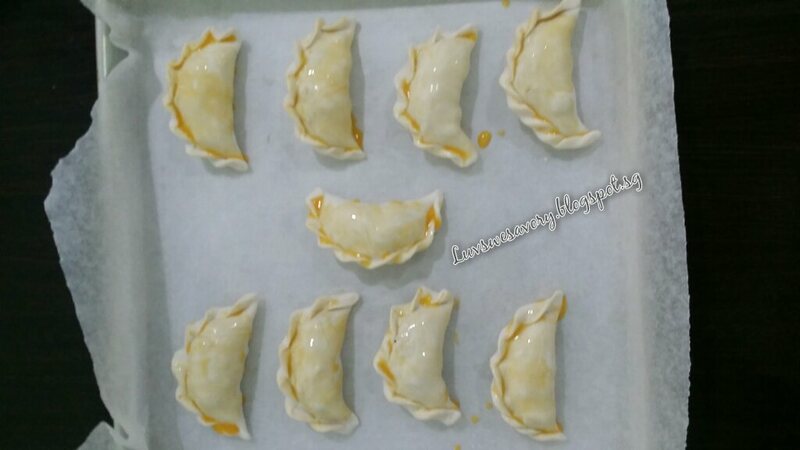 So, here I made baked mini chicken curry puffs, with ingredients like frozen green peas and curry powder easily available in my fridge/pantry. 1) Heat frying pan / wok in medium flame, add 1 - 2 tablespoons of cooking oil. 2) Add onion and garlic, cook for about 3 – 5 minutes or until soft. 3) Add the potato and cook for about 3 – 5 minutes. Next add the minced chicken, continue to cook for a few minutes. Break up the lumps using the back of the spoon. 4) Add curry powder and salt, stir constantly. Pour water, continue to cook for about 10 minutes. Stirring occasionally. Cook until the water reduced and potato is softened. 5) Stir in the green peas, add dash of pepper and give a few stirring. *adjust the taste to your preference. Off the heat and allow the mixture to cool. Preheat the oven to 180°C. Position the rack in the center. Prepare the baking sheet with lightly greased parchment paper. Place the pastry sheet on the light floured work surface. 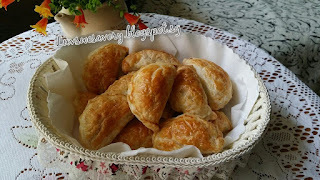 Use a round cup or a 7cm cookie cutter to cut out rounds from the pastry sheet. 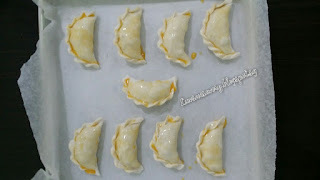 Place 1 tablespoon of cooled filling in the center of each circle. Fold/Press to enclose and twist the edges together to seal. 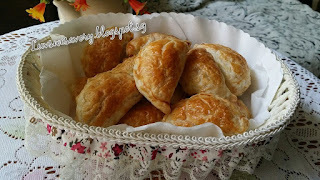 Brush the pastries lightly with egg wash.
Place the pastries onto the baking sheet and bake for about 20 minutes or until the pastries are golden brown. These flaky freshly baked mini curry puffs certainly tasted great when they're served warm. Enjoy ! Happy baking ... Have a great weekend! You are so creative Karen, these look absolutely delicious! Aah..this is so homey and satisfying, Karen. The stuff that makes me think of my childhood. 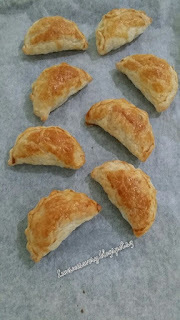 Karen, I am building up courage to make my own puff pastry.... but in the meanwhile.... store-bought works well for me too! I love any version of curry puffs! These looks yummy!